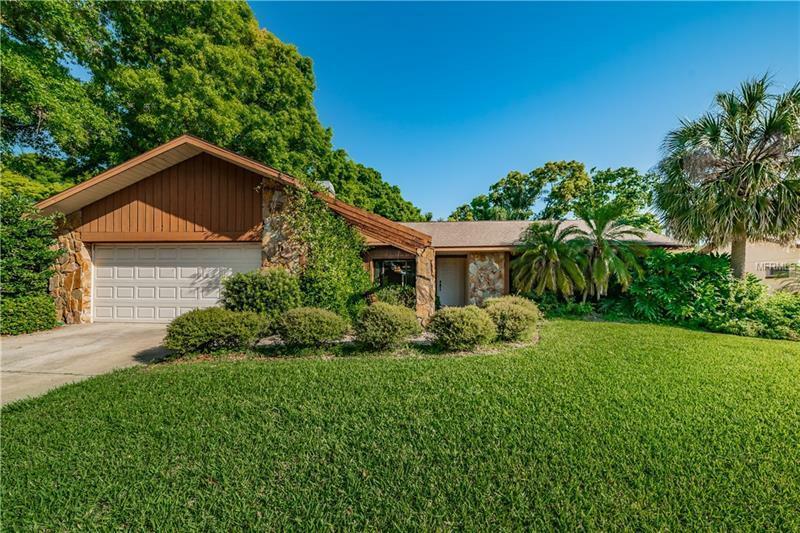 Palm Harbor pool home in the desirable Palm Harbor University school district! Located on a large .21 acre lot, this 4 bedroom/2 full bath/2 car garage/screened in POOL beauty fits all needs! Soaring vaulted ceilings and large windows keep this home light and airy! The open, updated kitchen offers white wood cabinets with soft close drawer system, thick granite slab counters, subway style travertine backsplash and ceramic tile floors! The kitchen layout offers plenty of space to food prep and entertain with ample counter space and a large island that opens to the family room with a wood burning fireplace! Glass sliders off the breakfast area and a charming window over the kitchen sink look out to the huge covered patio area, pool and private yard! The split floor plan of this home is ideal, offering a formal living and dining room! The second bathroom also serves as the pool bath with access from the patio! The master bedroom offers a flowing vaulted ceiling, walk in closet and direct access to the back patio! The goods: updated wood plank tile floors throughout and in 2 bedrooms, updated laminate wood floors in 2 bedrooms(NO CARPET IN HOME), fully fenced in yard, upgraded hurricane impact garage door, pool child safety fence, water softener, reclaimed water system, wired for surround sound, block construction & flood zone X(no flood ins req)! You are 5 mins to Honeymoon Island and downtown Palm Harbor restaurants & events! Wexford Leas offers the hard to find community park and playground! Florida Life! !